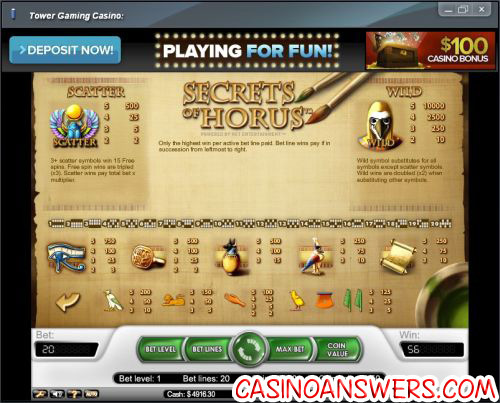 Secrets of Horus Video Slot Guide & Review - Casino Answers! Secrets of Horus is a 5-reel, 20-line video slot developed by Net Entertainment, featuring a wild symbol, scatter wins, multipliers and a free spins feature. 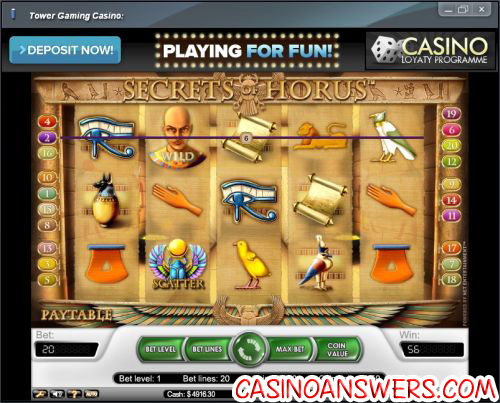 You can play the Secrets of Horus video slot game at Tower Gaming Casino and Casino Euro. Coin values on the Secrets of Horus slot machine are $0.02, $0.05, $0.10, $0.20 and $0.50. You can select 1-20 paylines on Secrets of Horus at 1-4 bet levels (the Net Ent equivalent of coins). Secrets of Horus is a dime slot, so you can bet anywhere from ten cents up to the highest available total bet of $40 per spin. Secrets of Horus is ideal for low stakes players, but high rollers will likely be able to find a suitable wager as well. If you are looking to manually stop the reels during a spin, hit the Spin button in the middle of a spin to activate the skill stop feature. To play Secrets of Horus at the highest bet level with all 20 lines enabled, hit the “Max Bet” button. For all other bets, simply use the Spin button in the center of the game buttons. The highest paying symbol on the Secrets of Horus video slot is Horus himself. If you hit 5 Horus symbols on a selected payline, you will win the 10,000 coin top jackpot. The Horus symbol is wild and substitutes for all symbols in the slot game with the exception of the scatter symbol. Whenever Horus substitutes in a winning combination, it will act as a 2X multiplier, so that your win will be doubled. Secrets of Horus’ scatter symbol is the Scarab symbol. If you hit 2, 3, 4 or 5 Scattered Scarab symbols anywhere on the reels of the Secrets of Horus slot game, you will win 2X, 5X, 25X or 500X your total bet. Hitting three or more Scattered Scarabs will win you 15 free spins with a 3X multiplier. Additional free spins can be won, but they will not use the multiplier. Free spins are played at the lines and bet of the triggering spin. You can win lots of cash if you trigger the Secrets of Horus free spins feature at Tower Gaming Casino! Secrets of Horus has an autoplay mode that can be opened up by hitting the “Auto” button. You can play 10, 25, 50, 75, 100, 250, 500, 750 or 1000 autoplay spins at a time. In the advanced settings, you can set the Secrets of Horus autoplay mode to stop on any win, if free spins is triggered, if the jackpot is won, if a single win exceeds (any amount you input) and if cash increases/decreases by (any amount you input). You can stop the autoplay mode at anytime. Secrets of Horus is a good video slot, although it lacks that extra “oomph” that would put it over the top as a great video slot. The highlight of the Secrets of Horus slot game is the free spins feature where your winnings are tripled for 15 free spins. While that is worth trying for, there’s nothing special that makes the Secrets of Horus video slot a must play. You can play Secrets of Horus now when you sign up and make a deposit at Tower Gaming Casino. Can the Secrets of Horus online slot be played by USA players for real money? Unfortunately, players located in the United States of America cannot play at Net Ent casinos at this time. There are lots of Egyptian-themed video slots American players can play, such as The Last King of Egypt video slot at Millionaire Casino. Can I play a free Secrets of Horus Flash game anywhere? Yes, you can play a Flash game of the Secrets of Horus slot machine at Tower Gaming Flash Casino and the Casino Euro Instant Play casino. You can play for free or real money. If you experience any issues with the Instant Play Flash software, we recommend making sure you have the latest version of Adobe Flash Player installed on your computer. What is the best way for Macintosh users to play Secrets of Horus? One of the great things about Tower Gaming Casino is that not only can Mac players use the Instant Play Flash casino, but there is also Macintosh casino software available to download and play on! It’s up to you to decide which you like better. Where can I read more about Tower Gaming Casino? If you want to learn all the details about Tower Casino, we strongly suggest you read our Tower Gaming Casino Review. Here’s a hint… we liked it! Where can I play the secrets of horus flash game?